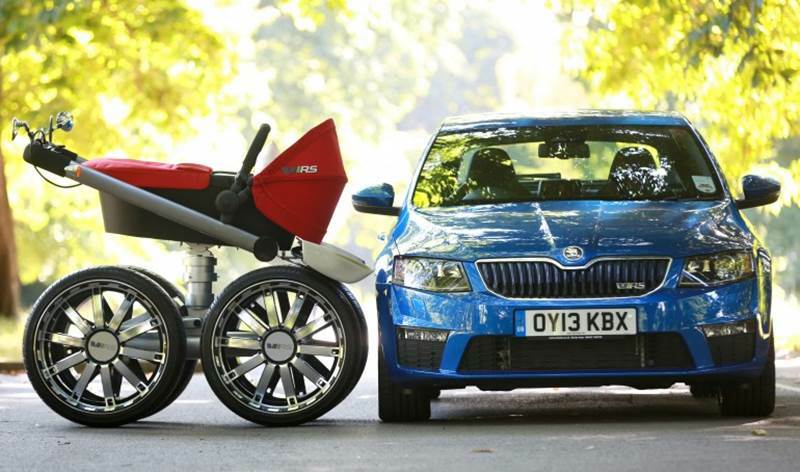 In news we wish we’d never heard, ŠKODA has unveiled a new “vRS Mega Man-Pram” specifically designed to eliminate the uncomfortable position many dads feel they face while pushing their wee ones around in a stroller. According to ŠKODA, this pram is desperately needed, because a survey of 1,000 British dads found that one third of them are embarrassed when cruising the town in a regular old baby stroller of daintier proportions. Furthermore, about 76% of those embarrassed dads said they’d be more willing to push their babies around if they had a higher spec stroller. This in mind, the new man-friendly stroller comes in a (ridiculously) big bad size, complete with wing mirrors, hydraulic suspension, sports-style upholstery, 20 inch alloy wheels, over-sized brake callipers, anti-stress grips and a headlamp beam for night walks, all meant to entice men into caring for their kids, which frankly, they should be doing anyhow, high tech stroller or not. Considering ŠKODA also notes that British dads use baby strollers for just one hour each week, this whole deal seems like major overkill — not to mention the insane amount of resources required to produce said Man-Pram. While it’s unclear if this man stroller will actually be released for purchase or if it’s just a really sexist joke, it’s still being featured in ŠKODA advertising and undermines men who do care for their kids, man stroller in hand or not. While parent equality between men and women isn’t a total reality yet, we still know plenty of men who are great dads. These dads are just fine with regular old strollers and are comfortable, not embarrassed, by baby wearing, attachment parenting, co-sleeping and more. Other than making men look bad, we’re not sure what the point is here. Frankly, we’re more flustered at the thought that a man might actually want to get behind this monster-sized push chair. In news we wish we'd never heard, �KODA has unveiled a new "vRS Mega Man-Pram" specifically designed to eliminate the uncomfortable position many dads feel they face while pushing their wee ones around in a stroller. 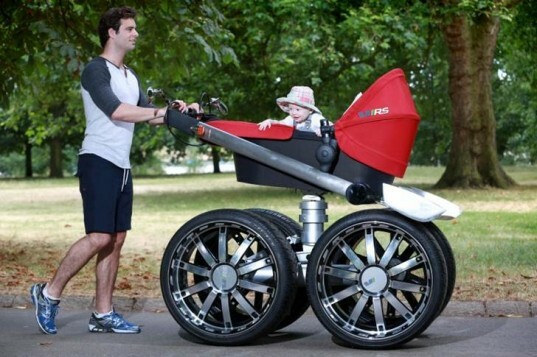 According to �KODA, this pram is desperately needed, because a survey of 1,000 British dads found that one third of them are embarrassed when cruising the town in a regular old baby stroller of daintier proportions. Furthermore, about 76% of those embarrassed dads said they'd be more willing to push their babies around if they had a higher spec stroller. This in mind, the new man-friendly stroller comes in a (ridiculously) big bad size, complete with wing mirrors, hydraulic suspension, sports-style upholstery,�20 inch alloy wheels, over-sized brake callipers, anti-stress grips and a headlamp beam for night walks, all meant to entice men into caring for their kids, which frankly, they should be doing anyhow, high tech stroller or not. Considering �KODA also notes that British dads use baby strollers for just one hour each week, this whole deal seems like major overkill -- not to mention the insane amount of resources required to produce said Man-Pram.